Researchers say Omega-3 fatty acids are mega-important to our diets these days. Scientists increasingly understand the importance of consuming foods rich in the polyunsaturated fatty acids, since they're vital to normal brain function and other elements of health, but can't be produced by the human body on its own. Studies show the acids can promote our cognitive and behavioral functioning, reduce inflammation and help lower our risk of chronic diseases such as heart disease, cancer and arthritis. That's why the American Heart Association recommends eating fish (particularly fatty fish rich in Omega-3s) at least twice weekly. While a wide range of processed foods now include Omega-3 additives, nutritionists recommend we get the essential ingredient from whole and unprocessed foods as often as we can. Consider how you might incorporate these delicious and nutritious Omega-3-rich foods into your regular diet. 1. Flaxseed: Now widely available in supermarkets, these oily seeds are a popular (and easy) additive for breads, cereals, casseroles, baked goods, yogurt and smoothies. The crunchy little powerhouses are the richest whole-food source of the omega-3 alpha-linolenic acid and are high in fiber, vitamin E, magnesium and other nutrients. 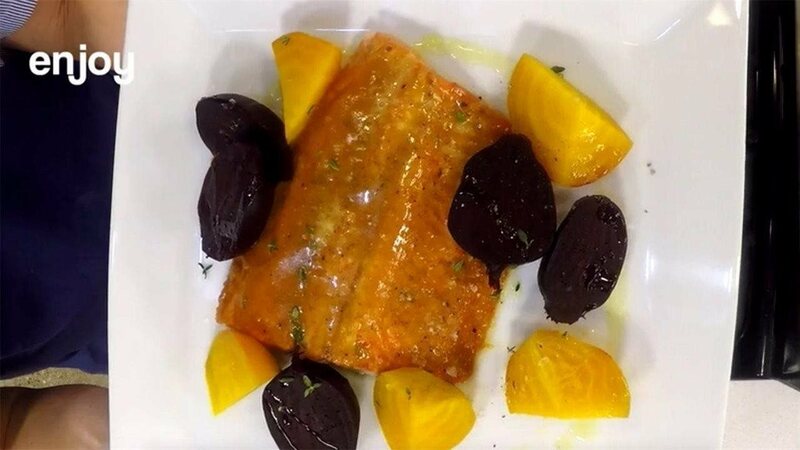 Steelhead trout: One of the healthiest seafoods available, this flavorful oily fish is rich in lean protein, vitamins and minerals as well as Omega-3s. For a delectable entrée, make a sauce by simmering 1/4 fresh grapefruit juice, 1/2 cup dry white wine and two stems of tarragon, reducing until syrupy. Stir in 2 tablespoons chopped tarragon, 7 tablespoons unsalted butter and salt and pepper to taste; keep warm. Cut three to four slits in the skin of the trout, placing it skin-side down in a nonstick skillet with 1 tablespoon vegetable oil. Add a bunch of broccolini that's been stemmed, peeled and cut into pieces. Saute over medium heat for 3 to 4 minutes; turn once. When the skin is brown and crispy, remove the fish and broccolini from the pan, spoon on the sauce and garnish with fresh grapefruit wedges before serving. Fortified eggs: Look for these specially labeled varieties laid by hens that are fed flaxseed, then use them in your omelets, quiches, casseroles and baked goods. One Omega-3 egg typically contains 340 mg of alpha linolenic acid and 75 to 100 milligrams of docosahexaenoic acid, each of which provides different health benefits. Soybeans: These tried-and-true protein sources pack 1,241 mg of Omega-3s in just half a cup, making them an excellent vegan option. As a bonus, they're also high in fiber, riboflavin, folate, vitamin K, magnesium and potassium. Popular forms these days? Tofu, miso, tempeh, tamari, soy milk, edamame or protein bars. Oysters: Most shellfish are very rich in Omega-3s, and oysters are among the richest. Whether raw, steamed, baked, tinned or fresh, the savory little protein sources come in multiple varieties and pack 565 mg of Omega-3s for every six consumed. Finding ways to incorporate Omega-3-rich foods into your diet could have lasting benefits to your health — and it's easy to do, since most of the foods are so delicious. Plan now to seek out these powerful foods at your local grocer and make them part of your regular routine. Meijer recently introduced Columbia River Steelhead Trout, a medium-textured fish farmed in the U.S., to its array of seafood options. Look for the entrée option at Meijer's 235 stores throughout Michigan, Ohio, Indiana, Illinois, Kentucky and Wisconsin.